Le Chiuse farm in Montalcino is a special place. One of our associates from the Holland Untour, Edmond, recently headed to Tuscany’s warm, sunny climes to enjoy the hospitality and wine at Le Chiuse farm and vineyards on the Tuscany Untour. Edmond also happens to be an excellent photographer. Here are some of his gorgeous photos of a memorable stay on the slopes of Montalcino in Tuscany. Stella pours out the family’s red wines for guests to taste, including their Rosso di Montalcino and the their award-wining Brunello. Stella and her husband, Lorenzo, live on the farm and oversee the winemaking. Lorenzo’s studies included time in California, at the Coppola vineyards in Sonoma. They are experts and provide warm hospitality. 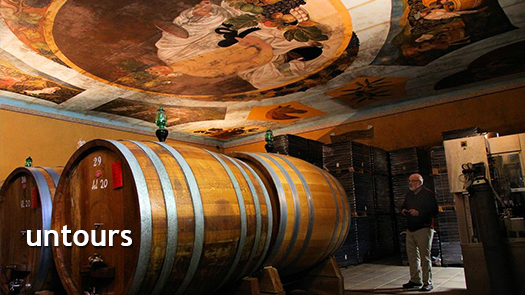 Guests tour the cantina on the farm property, where the wine ages in Slovenian oak barrels under the watchful eyes of Bacchus on the ceiling. (See the photo up top for the best view.) This oak and the long aging period (at least two years in the cask) is what turns the sangiovese into something special. Guests savor the wine and learn about the winemaking process. Stella tells them about the quality of various harvests and the taste profiles of the wines they produce. Outside in daylight, one can hike the pilgrim’s trail that leads up past the farm and stop to gaze down on Le Chiuse farm and its beautiful vineyards. The trail continues up up up to Montalcino above. Learn more about a stay at Le Chiuse farm and vineyard in Tuscany. Special thanks to Edmund guideholland.com for sharing these photos!